1999: National Paper - The Canadian Space Program. Credit: Canadian Space Agency. The National Space Paper – The Canadian Space Program would see the implementation of a new policy that would provide a stable base budget of $300 million for the Canadian Space Agency to start in fiscal year 2002/03. Based on a recognition of the need to address the Agency’s future funding problems now, the 1999 budget establishes a solid financial base to plan, implement and adapt Canada’s space activities. Up until this year the Canadian Space Program was funded on a multi-year basis; the new budgetary framework will allocate the CSA programmatic funding on an annual basis, giving the Agency much greater programmatic flexibility and funding stability. 1999 Canadian Space Program restructuring. Credit: Canadian Space Agency. Along with discussing the rationale beyond the restructuring the space program, the document delved into what was the current and future global space environment. It makes several points which continue to be relevant today. I’ve included some that are still relevant today. 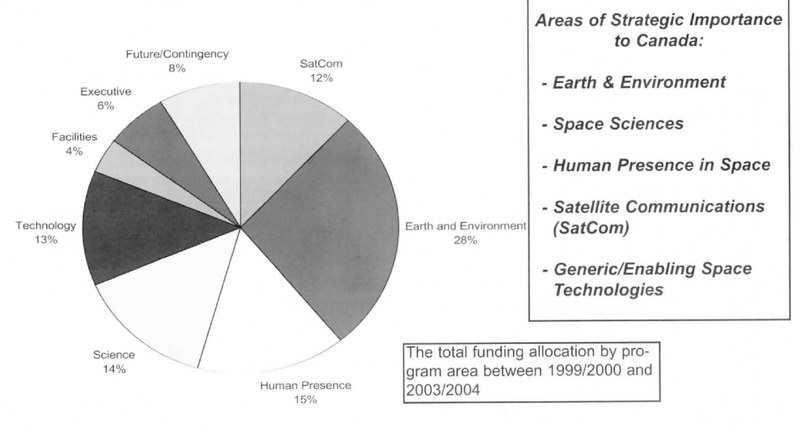 The global space market is becoming increasingly commercialized and governmental activity in space is being privatized . Although governments remain the primary space markets (both civil and military), the private sector’s role in space is growing, particularly in the areas of telecommunications, Earth observation, and launch services. This trend, which originated in the US and can now be witnessed in Europe, in Canada and elsewhere, extends to the definition, financing and implementating of projects on international markets. In satellite communications, for instance, traditional government-supported monopolies are spinning-off new private entities, which must compete with new or existing private sector players. More and more, governments consider purchasing their communications services on the commercial markets, even for some defense purposes. Important new players are entering the global space market and industry. These include companies from the defence and communications sectors that have enormous development capacities and very advanced technology. It also includes countries, such as those of the former Soviet Union, with whom many of the Cold War trade restrictions have been reduced in recent years , and countries such as India, China, and Brazil, which can increasingly offer world-class space-related products and services on the global market place. Important new geographic markets for space-based services are developing, of which Asia-Pacific and Latin American markets have been the fastest growing. Several countries in these regions have recently created new space agencies and adopted space programs to address their development needs. In doing so, these countries often attempt to leapfrog over terrestrial-based communications systems towards space-based systems. Space sector market forces, the life cycle for space products and the introduction of new services for consumers are accelerating, driven by greater competition, ever-improving and converging technologies and the growing role of capital markets in financing projects. Governments and industries world-wide are pursuing a “smaller, faster, cheaper” approach to space projects as a result of increasing cost and competitive pressures, leading to the development of small (and micro) satellites and launchers. You can download National Space Paper – The Canadian Space Program here.